If there’s a web page content that you would like to save for offline reading later, you can make use of the built-in feature in the Google Chrome browser which allows you to save a web page as a PDF file. The PDF file is the best format for document reading, printing, and sharing as it is widely supported across all devices. Unlike other web browsers, you don’t have to install any additional third party software or extension / add-on for this purpose. Just download the Google Chrome web browser on your computer and follow the step by step instructions below. 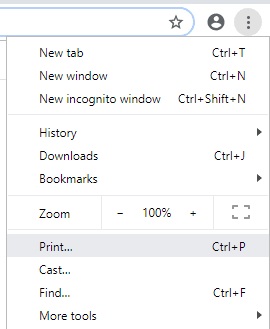 Open Google Chrome web browser on your computer and navigate to the web page that you would to save as PDF. Press CTRL + P (Cmd + P for Mac) to open the Print window. You can also access to the Print window manually by clicking on the three vertical dots icon located at the top right of the screen and select Print from the menu that appears. On the Print window, click on the Destination drop down list and select the option See more. The Select a Destination window will then appear. From this window, click on the option Save as PDF. Then, click on the blue Save button. You’ll be prompted to specify the destination to save the PDF file. By default, the filename will be the same as the web page’s title and you can also rename it to a different filename. 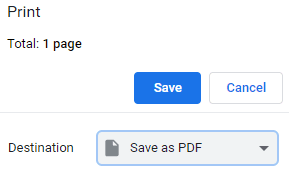 Click on the Save button and the whole web page will be saved as a PDF file on your computer. You just learned how to save a web page as a PDF using the Google Chrome web browser. If you have any questions or face any issue, kindly leave your comments in the comment section below.